"It is truly a family owned & operated business, therefore we do it with passion and a whole lot of faith. I don't believe you can truly appreciate farming and agriculture to its fullest, without faith and a belief in the Creator who made it all. " Number of cattle: Total: Approximately 250 head purebred cattle and 500 head of Commercial cows. Predestined Cattle Company owns about 40 head. Years this farm have been in business: Part of the initial Smith farm has been in the family for over 100 years. Purebred cattle have been here since the 1950s and in March 2018, we'll celebrate our 30th anniversary female production sale. Predestined Cattle Company started when Jennifer and I married in 2006, as a result of combining our individual herds that stemmed primarily from our past show heifers. Jennifer: I started showing cattle at age 3 and was immediately hooked! My grandparents took me all over the country to cattle shows. I have been involved on our family farm my whole life. Kyle has my dream job! Kyle: I am the Manager of the Smith herd along with owning Predestined Cattle Company with my wife, Jennifer, and children Grant & Diana Kate. Having both grown up in the Angus and Hereford Jr. Associations, Jennifer and I met showing cattle at the 1999 National Junior Hereford Show in Michigan. We were friends for several years before she fully realized how cool I was. We started dating and got engaged in 2005 while I was still home in Indiana. She approached me with the idea that in order for her grandfather's cattle operation to continue, they would need a herdsman. I moved to Georgia in the Fall of 2005 and we were married in 2006. Part of the deal involved me being able to bring a trailer load of my cattle to Georgia to combine with her family's herd. Kyle: I would say the favorite day would be when Jennifer and the kids can spend the day with me. With our busy jobs (Jennifer as a nurse) and kids in school, it's important to have those days to ride the pastures and check for new calves, and give the kids opportunities have real-world experiences and enjoy life on the farm. Jennifer: Favorite day is a day where we are all there together. I love showing the kids how to move cattle down a chute, checking pastures to find new babies, and of course working with any show heifers we may have in the barn. It is not hard to have a good day when you get to spend it with your family doing what has just come natural to Kyle and I our whole lives. Why is it important for us to judiciously use vaccines, antibiotics, and other animal health products? How does this benefit our industry and the beef product? Kyle: Healthy beef comes from healthy cattle, end of story. We use a whole-herd vaccination program from young calves to grown cows. Disease prevention and preparedness is important for calves to have a healthy start in life and to help aid mature cows for reproduction and productivity. If an animal were to get sick or have health issues, then and only then will we give antibiotics to rid that ailment. Furthermore, we obey label guidelines as to the withdrawal period before any animal is allowed to go to harvest for beef production. Jennifer: We love our animals and we want to give them the best care possible just as we would ourselves or our kids, and if a vet thinks that involves antibiotics, then we spare no costs to take care of them (and believe me, those medicines are pricey and not used without need). What does this farm mean to your family? Jennifer: This farm is our family’s way of life. My grandfather, husband, uncle and brother all work here full time. This is not something we take lightly. My grandfather is getting older and is very proud of the legacy he started 60 years ago. He knows this farm will be in capable hands and that we will continue to raise cattle that are productive and provide the customer service to our customers that they have come to expect from this operation. We are only as good as the people who buy our products say we are. Kyle: It is truly a family owned & operated business, therefore we do it with passion and a whole lot of faith. I don't believe you can truly appreciate farming and agriculture to its fullest, without faith and a belief in the Creator who made it all. And He uses us to take care of that precious creation. It takes a lot of patience and prayer, but it's rewarding to work hard to provide food for your family and the rest of world, all while making sure the next generation has the opportunity to do it better than you did. It's important to realize too that even if my kids don't want to farm someday, their root system is always set in this way of life, and they'll always know where they came from, and where food comes from. What makes your operation unique? 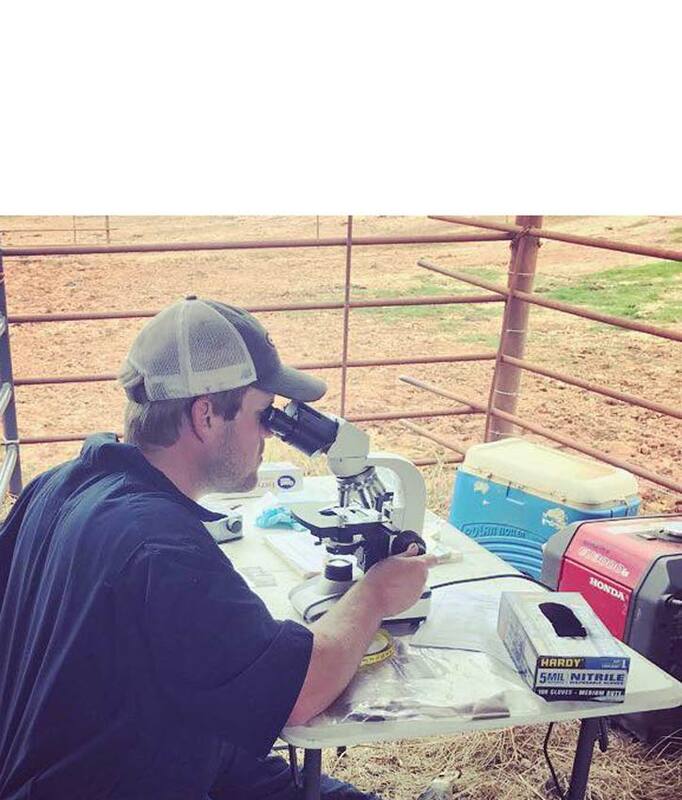 Kyle: Probably the diversity of this cattle operation is what makes it unique. Typically seedstock producers focus on one breed of cattle, where we are nearly equal on two breeds. And those two breeds are multi-purpose breeds, especially for the production of black baldy females. Jennifer: I love that most of what we feed our cattle we also raise. We have a feed mill that is older than me, and we use it to mix our own feed. I think this is so unique in that most ranchers rely on a feed store to get their feed and we mix all of our own with the crops that are grown here such as corn and cotton seeds. What is your favorite cut of beef? We both love a juicy, tender cut Filet. What message do you hope to pass on to your kids about farming and production agriculture? Kyle: To say what the "message" will be is hard to put into words, but I feel that just by them growing up in it, and experiencing it every time they walk out the door, and every time they sit at the table and eat food, it is such a natural part of them, that they'll always be a spokesperson for agriculture. We'll also raise them with an understanding of the importance of honesty and integrity. So when our children grown up, they not only promote and defend farming and agriculture, but they'll also sell it because of their character. Jennifer: That it is such a privilege that we have been given to be born into a family of farmers. And the sacrifice and hard work that is done on a daily basis, is to glorify and honor God who has given the Smith family the opportunity to work this land. I hope that they believe that what we do is vital to feed this world and I know they will be better humans because of the values they have learned from being raised here. In a world of misinformation about how beef is raised, what do you want the world to know about beef production? Kyle: If you come to our farm, we probably won't talk to you much about how we raise beef, rather, we'll show you. When you see my children eating the sweet corn that grows in our corn fields, and the steak or hamburger that came from our cattle, you won't have a concern about the safety of our food, because we're feeding it to our children. Watch us how we work and process cattle. Safety is a concern for both the humans and the cattle. Safe handling systems, slow and steady actions, and Beef Quality Assurance protocols will keep the cattle calm and safe from injury. As I stated earlier, healthy beef comes from healthy cattle, and healthy cattle are usually happy cattle. I'd say our cattle live a pretty happy lifestyle in Wadley. Jennifer: That we take care of our cattle above ourselves. We don’t eat, sleep, or take care of ourselves until the cattle are cared for. I have seen my husband and grandfather work in hurricanes, ice, snow, and floods. They always value the cattle before their own safety. We never look at the animals as though they will eventually go to slaughter, we treat them with dignity and respect and give them the utmost concern while they are here on this farm. Their well being is our way of life. If they don’t eat and grow, we will be out of business. Seedstock production is a specialized cow-calf operation that produces purebred or registered cattle. 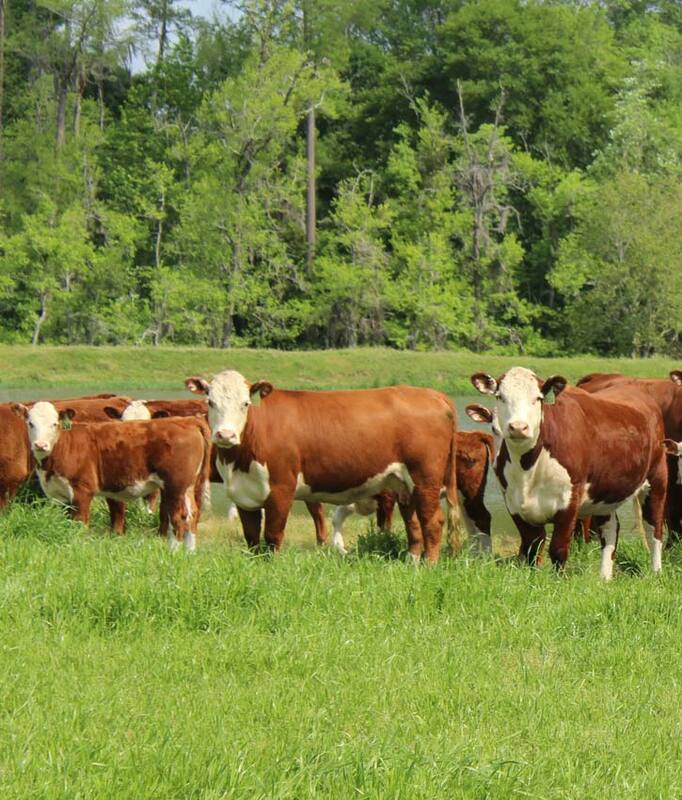 The goal of seedstock production is to make genetic improvements in cattle that benefit the entire beef industry.